Our first view of wildlife in Amboseli was a sea of green, spotted with hundreds of grey, white, striped, spotted, and varying animals for as far as we could see. The meltwater from Kilimanjaro had created a plethora of green grass for all the grazers to feast on. 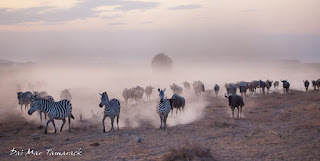 We could see herds of all the usual suspects with a few new animals to the group. It didn't take long for us to see our first predator. 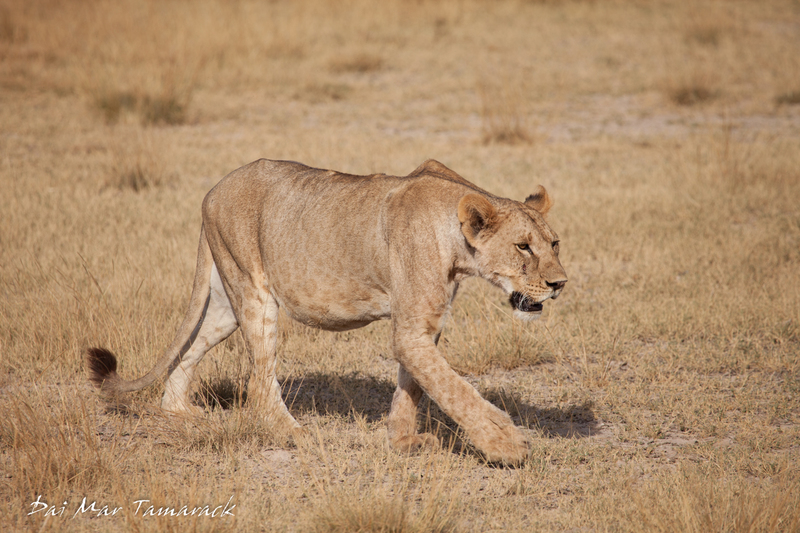 A lone lioness was walking across the dusty plane towards the swamps when we spotted her. She walked towards our car, turning at the last second to walk across the road behind us. 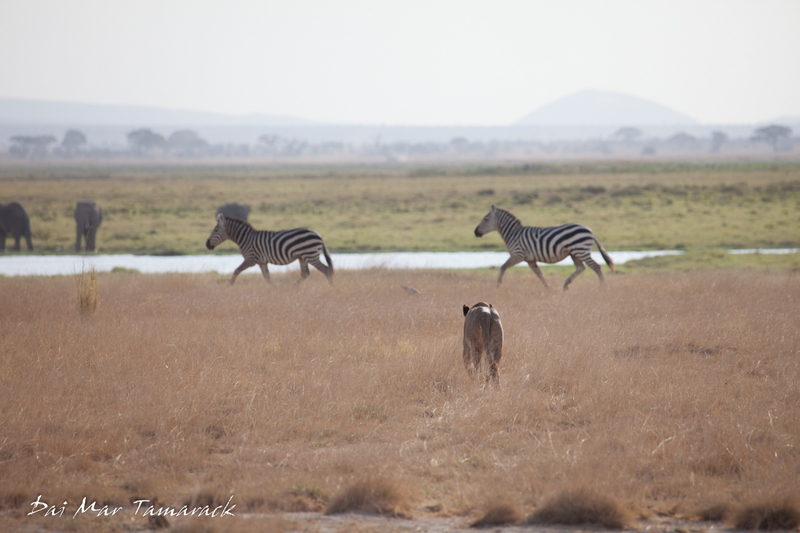 She scared a herd of zebra on her way but seemed more intent on reaching the water than wasting energy on hunting in the mid afternoon heat. 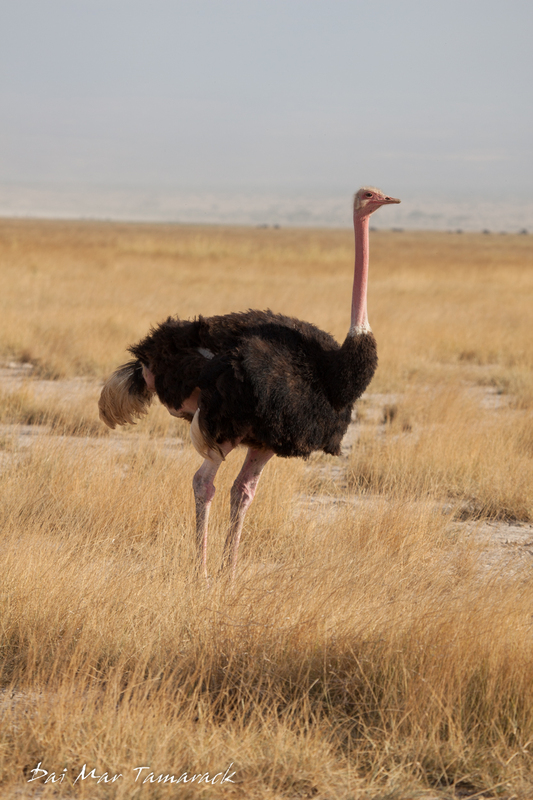 Ostriches looked comical as they walked across the plains, their huge and powerful legs almost the same size as their necks and tiny heads. 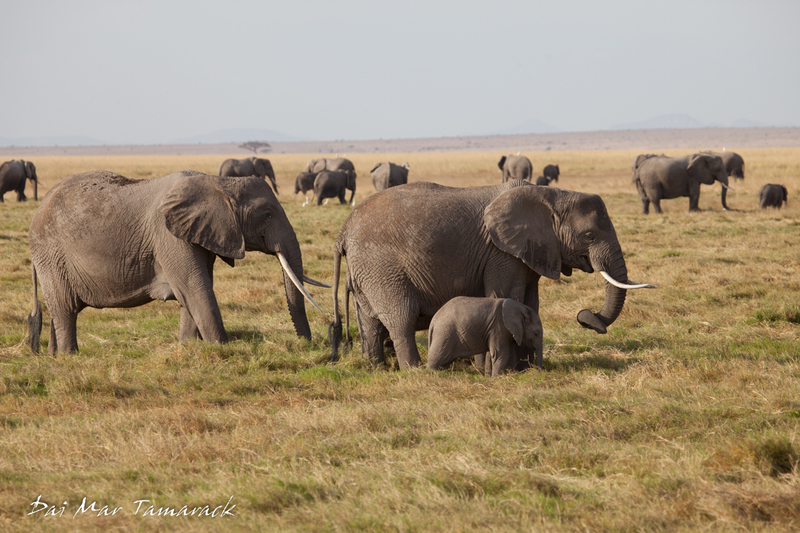 As far as we could see across the flat land herds of elephants were visible in all directions. 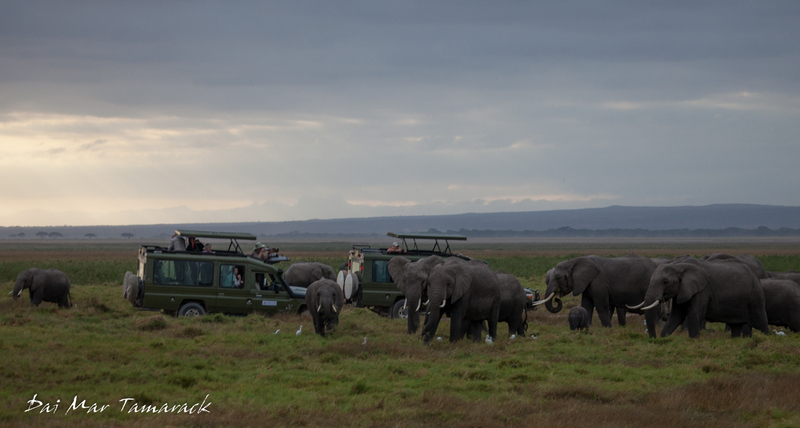 It must have been a good couple of years for these elephants here in Amboseli because the babies were plentiful. With a gestation of almost 2 years it means that the conditions must have been good for a while for so many successful breeding to have occurred. The views across the plains were breathtaking. 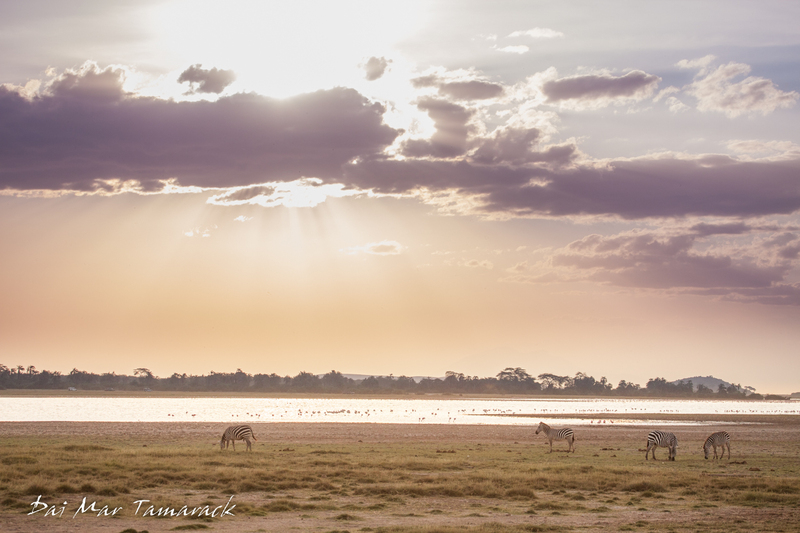 Even the dry salt pan that I have driven across in past visits was filled with animals...and water. 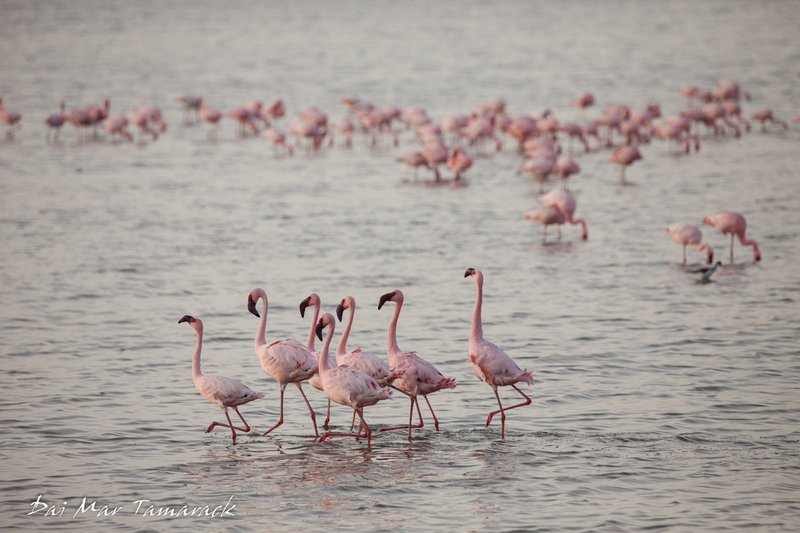 Lesser flamingos dotted the lake, turning it pink on the horizon. 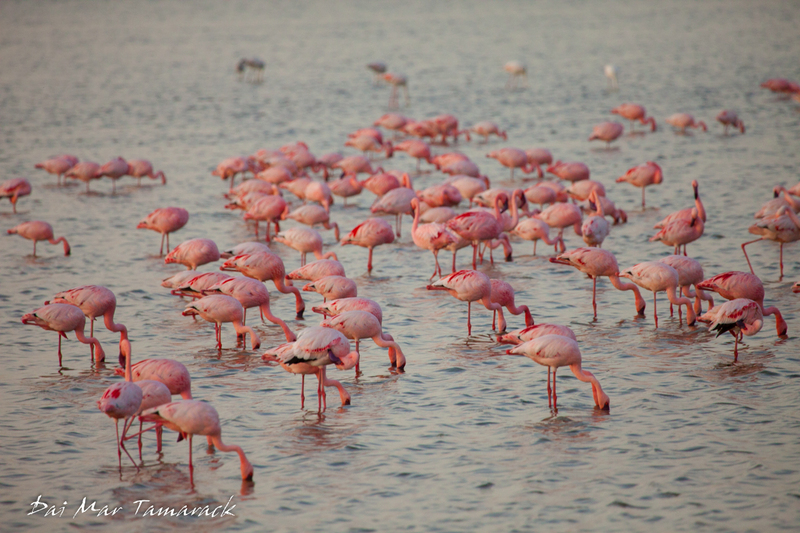 I had wondered where all of the flamingos from Lake Nakuru had disappeared off to but now I know. We spent some time admiring the comical movements and noises of the flamingos. We noticed some white young ones mixed in with the pink older flamingos. Look for some fun videos of their antics to come later when I have better internet connections. 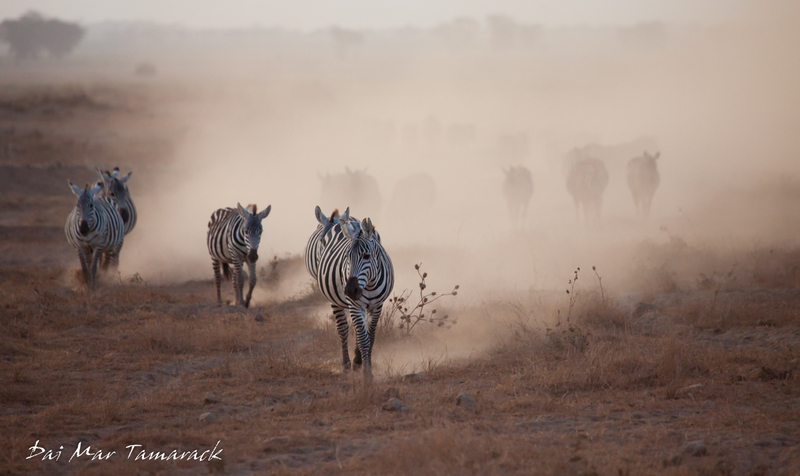 Even though the main draw of Amboseli is the water filled marshy swamps, I am often drawn to the dusty plains surrounding them. It is here that you find conditions for truly magical African encounters. The dust here is a fine white powder that is easily kicked up by the smallest movement. 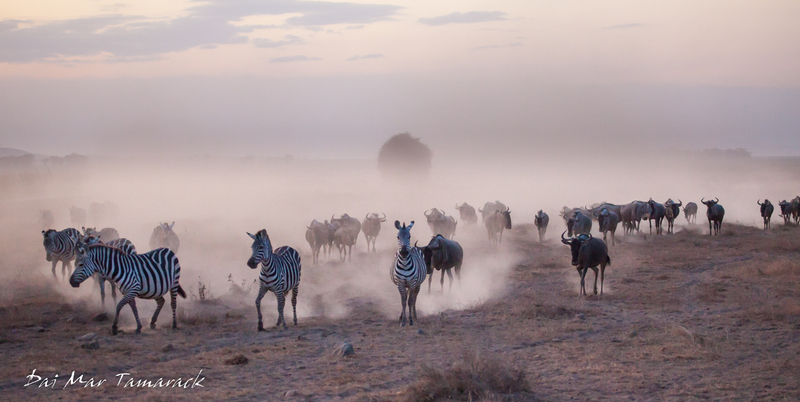 Add a herd of hundreds of zebra and wildebeest and you have the ingredients for a beautiful photo. 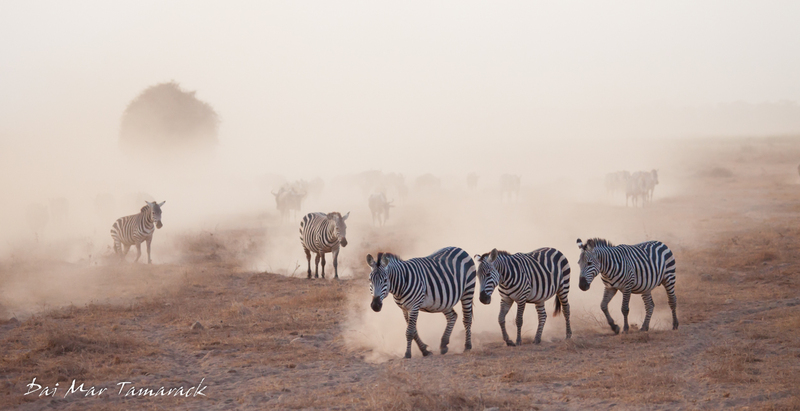 The sun had set, the light was dimming, but a group of three zebra heading in our direction were leaving a clouds of white dust in their wake. It took me a second to realize that there were hundreds more heading our way, emerging out of the dust cloud in an ethereal migration. We waited until the last one passed in front of us before scooting back into our lodge. 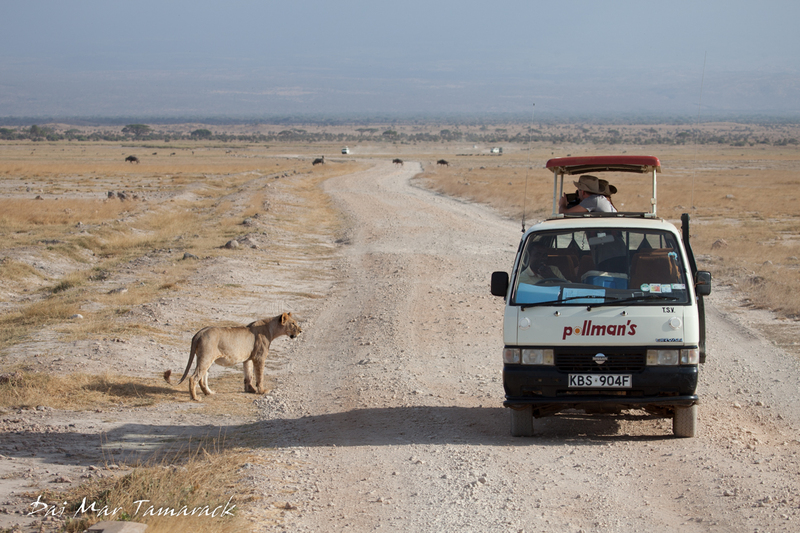 Our morning game drive proved just as exciting. 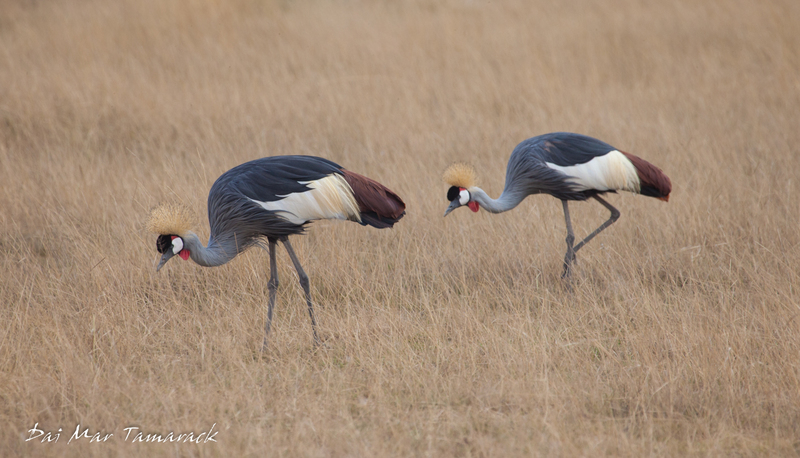 We started with some wonderful early morning light and early morning sightings. 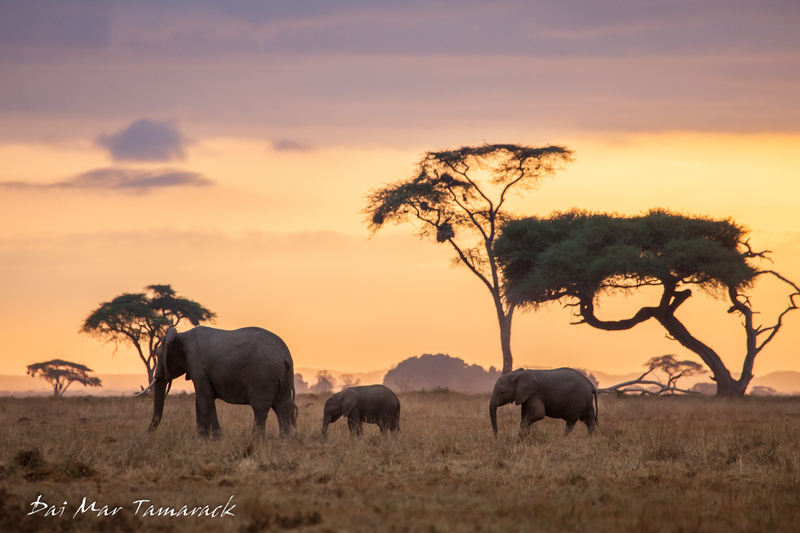 The elephant herds were still on the move with even smaller babies than the day before. We also happened upon a couple of night time critters that were just heading back to their daytime hiding places. 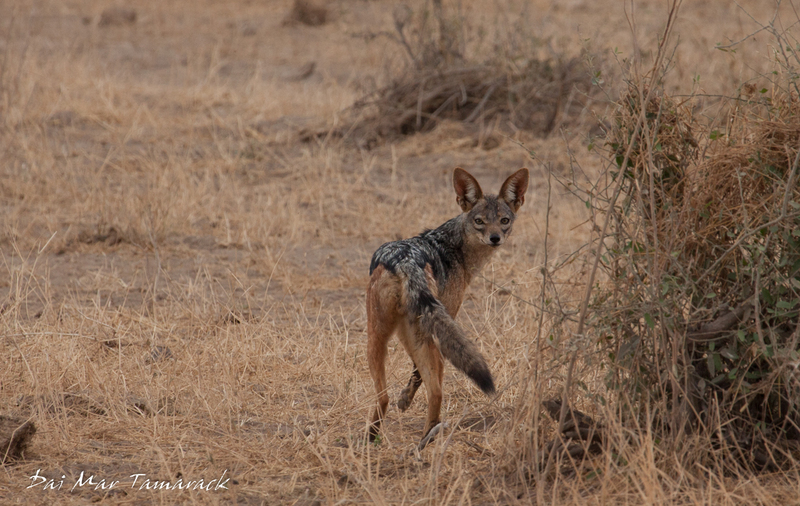 Small jackals called black backed jackals checked us out as they scurried away from the oncoming vehicle. 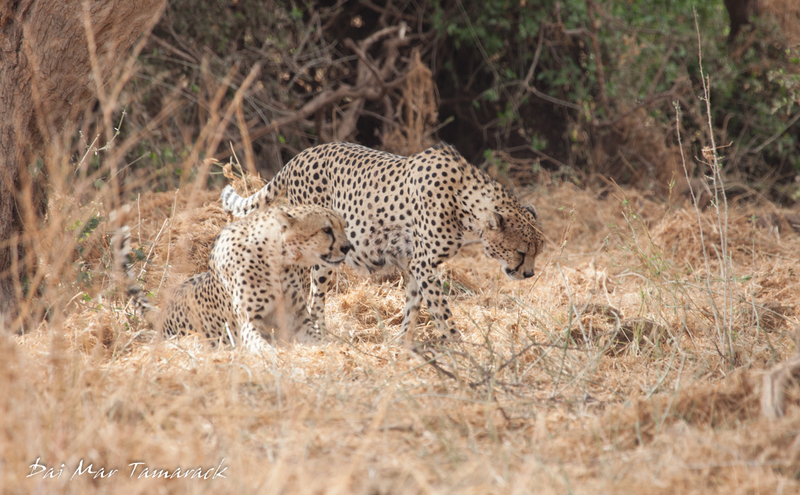 Then we spotted a truly rare find, a small spotted cat disappearing in and out of the golden grass (just like in a dream Deedee had the night before.) 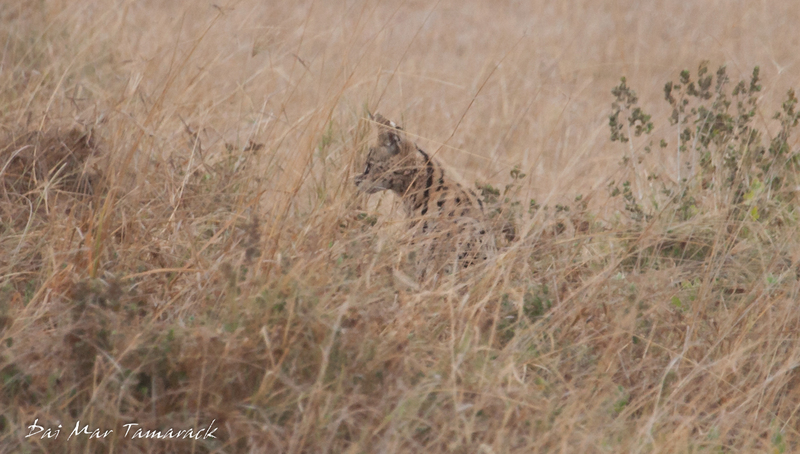 We got a few quick views of what turned out to be a serval cat, a long legged mini leopard type cat that I've only encountered a few times in my African travels. 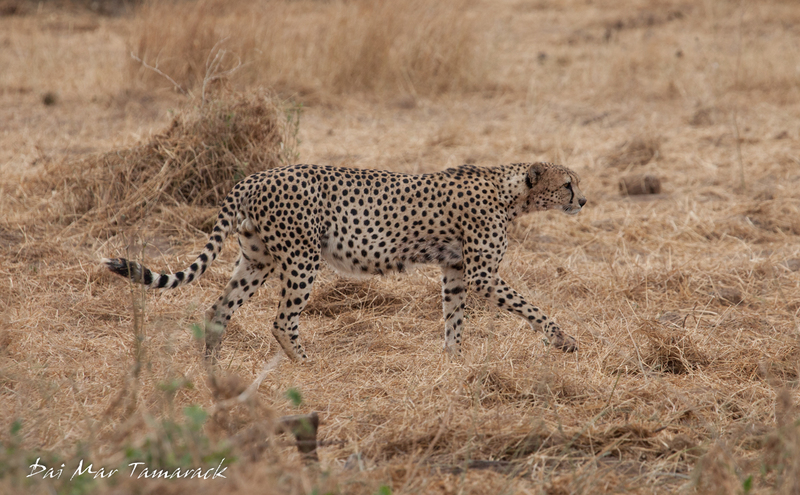 After the serval we ended up finding one of its more well known cousins, the cheetah. And not just one, but three brothers. 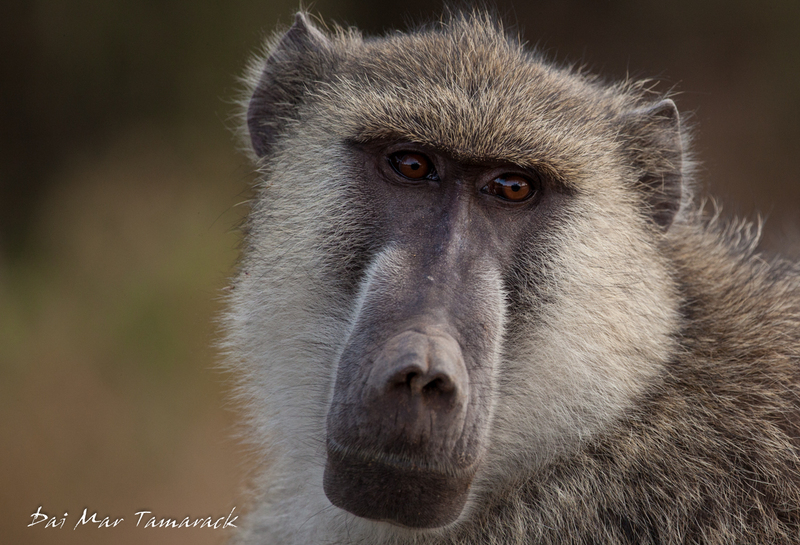 They looked pretty sleepy, and full from a recent kill. Next to the wild dogs in Tsavo, cheetahs are one of the rarest animals we will see, with only 7,000 still remaining in the world.